Lissa Nevsky's grandmother leaves her a big, empty house, and a legacy of magic: folk magic, old magic, brought with Baba when she fled the Gulag. In the wake of her passing, the Russian community of Toronto will depend on Lissa now, to give them their remedies and be their koldun'ia. But Lissa hasn't had time to learn everything Baba wanted to teach her—let alone the things Baba kept hidden. Maksim Volkov's birth family is long dead, anything they bestowed on him long turned to dust. What Maksim carries now is a legacy of violence, and he does not have to die to pass it on. When Maksim feels his protective spell fail, he returns to the witch he rescued from the Gulag, only to find his spell has died along with the one who cast it. Without the spell, it is only a matter of time before Maksim's violent nature slips its leash and he infects someone else—if he hasn't done so already. Nick Kaisaris is just a normal dude who likes to party. He doesn't worry about family drama. He doesn't have any secrets. All he wants is for things to stay like they are right now, tonight: Nick and his best buddy Jonathan, out on the town. Only Nick is on a collision course with Maksim Volkov, and what he takes away from this night is going to crack open Nick's nature until all of his worst self comes to light. Baba had been dead for four days by the time Lissa got to speak with her. CLAIRE HUMPHREY is a national buyer for Indigo Books. Her short fiction has appeared in Strange Horizons, Beneath Ceaseless Skies, Apex, Crossed Genres, Fantasy Magazine, and Podcastle. Her short story ''Bleaker Collegiate Presents an All-Female Production of Waiting for Godot'' appeared in the Lambda Award-nominated collection Beyond Binary, and her short story "The Witch Of Tarup" was published in the critically acclaimed anthology Long Hidden. 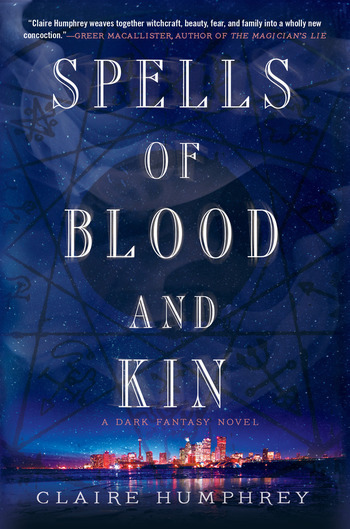 Spells of Blood and Kin is her first novel.